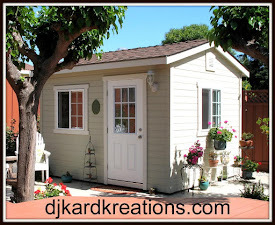 djkardkreations: Loll's Mixed Media Tag Event! Loll's Mixed Media Tag Event! 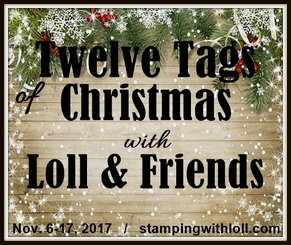 I'm honored to be here today as one of the special Guest Designers taking part in my friend Loll's inspirational Twelve Tags of Christmas event! There are awesome prizes to be had and the gallery will remain open until November 22! Loll is showcasing "mixed media" art for this tag event. I thought at first this would be out of my artistic range, but I was happily wrong about that. If you are primarily a CAS card artist and think you might not manage mixed media, check out the definition below my tag. In the proverbial words of Babe Ruth, if I can do it, you can do it! Make a tag with stamps + ink: my snowflake is stamped in Lost Lagoon ink. the snowflake e/f embossed on glossy paper. That's it! How EZPZ was that?! In addition to the requirements, I added a lovely soft-grained Lost Lagoon ribbon from SU and I backed my tag with another layer of the shiny metallic paper I used to die-cut the sediment word. Tags are on fire right now all over Blogland! We all love them, we all make them, and I'd love to see your tag(s) entered in this fun event of Loll's. You can link up here! 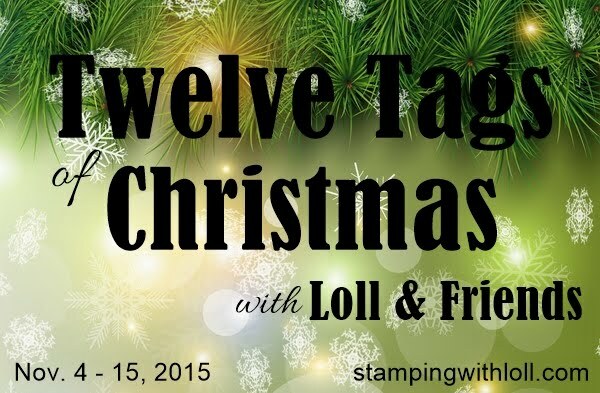 Happy Little Stampers Christmas Challenge: Tag. 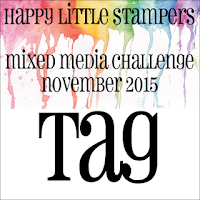 Happy Little Stampers Mixed Media Challenge: Tag. The smart boy figured out he would be out of the rain a little bit if he perched on top of the swing! Please help me welcome these five new talented friends to the Playhouse! Juhi of Juhi's Handmade Cards. Juhi is originally from Bangladore, India, but she now resides in Singapore. She has been blogging since 2009. Her cards are truly works of art, worthy of framing. You may have seen them in the winner's circle at challenges. You will be inspired by her vibrant colors, her video tutorials, and by how impactful her CAS designs are! Ruth of Crafting While the Baby Naps. I just love that blog name and admire any mothers who manage to mother AND blog! Ruth began her blog just this past February so she is brand new to our community! Please do make a special effort to visit Ruth and introduce yourself! Her cards are not only clean and simple, they go the extra mile with her excellent crisp execution and brilliant coloring! Rita of Cards by Rita. Rita has been blogging since she became a Stampin Up demonstrator in June of 2010. She is a SAHM who lives in Texas. Rita enjoys making her beautiful cards to send to friends all over the world. 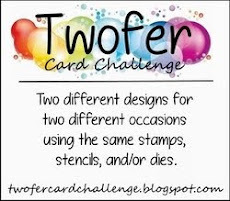 Her expertise with Copics is apparent in her cards which are radiant and fun! Plus, she often shares adorable family photos with us! Shirley of Glittered Paws. Shirley lives in Missouri and she started her blog in 2009. She is a retired nurse who is now a hopelessly addicted papercrafter. As her blog name suggests, Shirley and her husband have plenty of beloved pets underfoot gathering glitter from Shirley's art studio! Shirley is another Copic Certified Designer whose cards are simply gorgeous! Maureen Wong of My C.A.S.E. Studies. Maureen started blogging in 2008! She is the mother of two humans and two furballs. Maureen loves blogging and visiting other crafty blogs for inspiration. She has served on many design teams and she was a Stamping Royalty winner in 2014! Needless to say, you will find oodles of design ideas on Maureen's blog! Love your tag, Darnell! Especially the way you made it two layers - great effect! Wonderful embossed background too! Loving this two layer tag, Darnell! What a stunning color! Darnell, this is gorgeous! The color and design are outstanding. I particularly love the double tag and the beautiful ribbon you used on this. The sheen on your cardstock enhances the beauty of this one too1 LOVE this! Beautiful tag Darnell, love the embossing! Fab tag, Darnell. love the pretty colours and sheen. I think it's high time to get my snowflake embossing folder out of hiding. Also loved Loll's tag using this same EF. Fabulous tag Darnell .... the texture looks great, love the hint of colour on the embossing. Speaking of the colour I love that icy shade of blue .... stunning!! Loll is amazing at convincing us that we can do, and often do, mixed media! Love that hint of color around the embossing and the double tag with the pretty ribbon! You sure have a smart hummer. Ours would perch in the tree over the air conditioner when the fan was running. They've gone to warmer places now and the Winter birds are starting to come back. Beautiful card with these two panels and the embossing!So lovely! This tag is a beauty. I really like your color choices. Guess I should give it a try. Gasp...gorgeous, Darnell! I have Lost Lagoon ink which, until seeing your tag here, I've had zippo clue what to do with it..and now, I am stoked! Hope you don't mind a bit o'casing! Swooning...mega swooning! My, my mixed media...and you've aced it. This tag is really gorgeous. I'm so impressed with the embossed color. It's definitely a WOW! Oh I love this tag Darnell!! The color that you used is divine. I also like the embossed background and the way you used two tags on top of each other. LOVE the photo!! Such a pretty tag Darnell, love the matching ribbon as well. So nicely constructed and designed. Pretty tag, Darnell! I think you have mixed media down pat! What an elegant tag Darnell, my goodness!! Your shimmering Mixed Media tag looks fabulous! Way to go! Love your sweet double tag with the greens, the embossing and lovely shine! Congrats on being able to include the "mixed media"! I love your tag, it's gorgeous and inspiring. 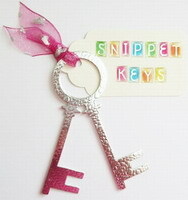 Your tag is super lovely and will add some elegance to any Christmas package. Nice work on mixing your media! Love your mixed media tag. Darnell, you are making it look too easy, when I know it is not. Wowsa... that is a fabulous tag! Gorgeous! Wonderful mixed media tag! Those colors are beautiful and the shimmer on the part is splendid! Awesome sauce design! Hugz. Darnell, your tag is beautiful. The colour is really striking and I adore your embossing with a touch of that beautiful turquoise. What a pretty mixed media tag you've made Darnell. Love that colour blue. You are so lucky to have Hummingbirds visit you. Your tag is absolutely gorgeous! LOVE the texture!!! Wonderful tag...so glad you were able to participate! I like the texture of the embossing and the sparkle. Can't have too much sparkle. So happy you are getting some rain (and hopefully not too much all at once). That poor little hummingbird is probably thinking...what the heck is this stuff?! Your tag is wonderful and beautiful! Job well done! At least you're having rain and not rain followed by snow like us! Makes for slippy driving! Stunning tag(s) Darnell! I adore the colours you used - and the ribbon is so luscious - a perfect foil for the wonderful embossing die cut and so on. LOVE it! And bless your little hummer, hiding from the rain! So sweet. WOW, that metallic paper is really beautiful, Darnell - love the wonderful colour!!!! 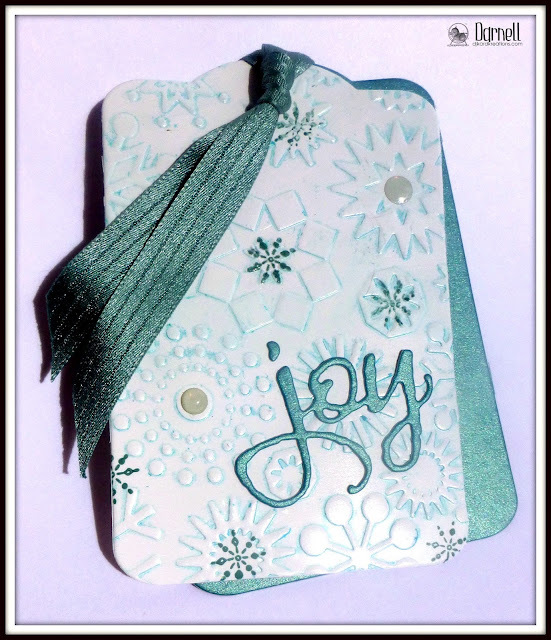 Your tag is stunning - the embossed snowflakes with the subtle colouring are lovely!!! The ribbon is beautiful!!! Such a beautiful tags. They look so real. Wonderful work. So pretty. Love your 2 layerd tag and the pretty color. The shiny metallic paper looks great. Fabulous tag Miss Darnell...love those pretty blues. A wonderful tag Darnell, loving the colour. Gorgeous tag, dear Darnell. Your attempt of mixed media gave a great result. :-) I hope you will create more cards in this technique. Smart bird! And cute too! ADORE your tag! The SU ribbon steals the show and seems to be a perfect match for the glitzy background paper! Nice touch with the 'cabochon' looking centers on the two large snowflakes! Wonderful texture and color for your tag design Darnell. 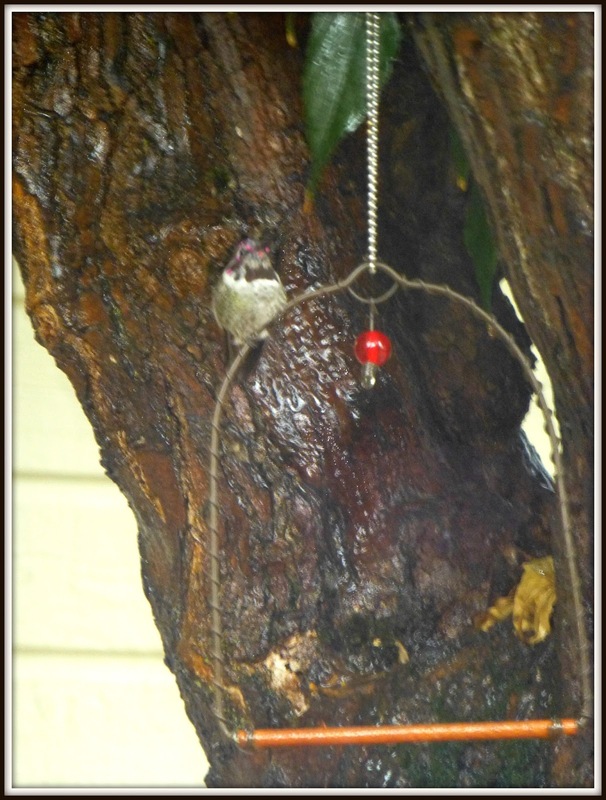 Glad to see you little hummingbird is staying dry. Beautiful tag design and I really love the colors of it. Awesome shimmer! Wohoo! I do love the fact that even CAS card makers can work mixed media magic and you did it so awesomely :) love the idea of embossing the shimmery paper. Gorgeous tag! Gorgeous work Miss Darnell, love the techniques on this one and I do love me a blue Christmas so much! I finally remembered what we all doing jumping in and around the pond at the Playground. Sarn and I were doing a rain dance to try to get you some rain out there in the USA and it worked! Yay do you want us to dance and see if we can get some more?! Make sure you bring the hooch though, it seems I can only do the rain dance if I'm well lubricated! Hello Darnell, you can impress me! What a beautiful tag! Everything worked out to the smallest detail. And the end result simply dazzles! Your tag is beautiful, Darnell! The colour is gorgeous and I love the embossing and beautiful ribbon! I looked at Loll's challenge and saw mixed media and decided it wasn't for me. But you make it look so easy, so I might have to give it a second look! If I can find my lost mojo, I will do that! Your little hummingbird is sweet - we won't see ours again until next summer - I find them mesmerizing to watch! Big congrats on being one of Loll's designers! Seeing the MM definition here, I think I can enter the tag I just posted on flickr--thanks for the info! Your tag is gorgeous with the metallic paper! So fun to see the hummer--glad you had rain & hopefully no damage. I wasn't sure about mixed media either, Darnell, but it's rather fun isn't it? What a wonderful mixed media tag! I also really like fall leaves with rain animation picture - because it reminds me of Seattle. However, it's raining buckets and cats and dogs and the wind is blowing a gale! What fun we are having! Watching the rivers crest, time to stamp! lovely tag, I like how you have created the snowflake background. 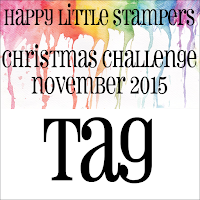 thanks for sharing with us at Happy Little Stampers Christmas Challenge. Wow, no wonder you have instructions to get to the bottom of your comments, you have a lot of admirers of your work. This tag is so much like the card I wanted to submit to Merry Monday but too late...I have never made tags but you have inspired me to maybe create some this Christmas...just another touch of a personal gift. This must be the most co-ordinated tag I've seen, Darnell! Love the shimmery paper and the touch of colour around the embossing.